Since my first attempt at talking about 2001: A Space Odyssey was such a resounding success (Stanley Kubrick fans lined up to hurl insults at me), I thought I might as well finish what I started and try to set the record straight on what I think about this film. I hope I’m not committing an unpardonable sin, but I would like to compare and contrast 2001: A Space Odyssey with the very first Star Trek film, Star Trek: The Motion Picture. What’s the worst that could happen? First of all, I sort of like Star Trek: The Motion Picture. Its slowness is one of its bizarre charms. It’s a wonder to watch a movie like this because it doesn’t seem particularly interested in whether the audience comes along for the ride or not. I feel like it’s daring me to sit through it. Also, I’ve heard Star Trek: The Motion Picture compared to 2001: A Space Odyssey many times, but I’ve never heard anyone put their finger on all of the similarities. Instead, I’ve just heard general statements about the two films having a similar style and being about the vastness of space. I’m going to attempt to clearly explain how Star Trek: The Motion Picture is virtually a remake of 2001: A Space Odyssey. So open the pod bay doors and set phasers on stun because our human adventure is just beginning. The beginning involves a group of primitive creatures facing an unknown entity. The space scenes are long and slow-moving. Music plays an important part in highlighting onscreen events. A commander is unwittingly demoted. The crew is in the dark about their superiors’ intentions for their mission. A character drifts aimlessly through space and has to be rescued. A man and a machine face off in a battle of wits until they reach a stalemate. A computer’s circuitry is cut at a key moment, forcing the humans to take action. The aliens responsible for much of the plot remain unseen. A human merges with an alien entity to become a new lifeform. Both films begin with a long opening scene that foreshadows later events. In Star Trek: TMP, three Klingon Birds of Prey fly toward a huge cloud in space. They decide to fire photon torpedoes at it, but they have no effect. The cloud isn’t happy with their unprovoked attack, so it promptly uses its advanced weapons to vaporize the Klingon ships. In 2001, a group of apes come across a tall, black Monolith, which somehow infuses them with a rudimentary understanding of tools, and they use that knowledge to defend themselves from a rival tribe, thus ensuring what they learned will be passed down to future generations. 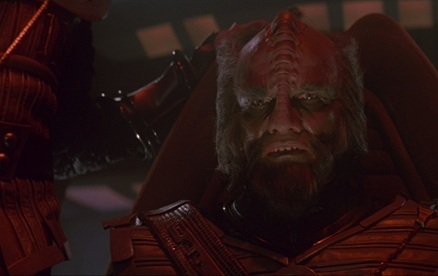 I’m sorry to say this, but there’s little difference between the 2001’s apes and Star Trek: TMP’s Klingons. The way the Klingons are portrayed in this film gives us no indication that they’re anything more than unthinking warmongers. Their language sounds like a series of grunts, and they don’t offer any explanation for why they fire at the cloud when they haven’t even attempted to establish communication with it. That’s not an effective way to say hello. If this had been the only Star Trek film, we might have assumed that the Klingons had de-evolved since the original TV series. Luckily, they got better over time. Star Trek VI: The Undiscovered Country is the only film in the series that takes the time to give the Klingons a great deal of depth, though. Now is an appropriate time to talk about the slow-moving spacecraft motif in both of these films, since this takes up a lot of screen time. The first space scene in these films shows one ship going to dock with another. There’s no dialogue for several minutes as the ships methodically make their way to their destination. There’s a famous jump cut in 2001 when an ape throws a bone into the air and as it comes down we suddenly see a spaceship in orbit around the earth. This scene shows how space travel has become commonplace. It really is beautiful how the spacecraft interact and have to synchronize their movements with each other in order to dock. But the scene starts to drag after the first few minutes. After we’re introduced to Admiral James T. Kirk on earth, we soon see him slowly making his way to the Enterprise from a space station. This long, loving flyby of the newly redesigned Enterprise is certainly pretty, but it brings the film to a screeching halt and takes the wind out of the sails of Kirk’s speech just a minute ago stressing that time is of the essence to save humanity. I think the reason the Enterprise moves so slowly in Star Trek: TMP is that the filmmakers wanted to convey just how large the ship is supposed to be, compared to anything we’re familiar with. Kirk’s flight, while on the dull side, does indeed give weight to the Enterprise as being more than just a model. Plus, it sets up just how grand the space cloud (which we learn is called V’Ger) is when they fly into it. Suddenly, the Enterprise (which we thought was enormous) looks like a drop of water in a giant ocean. While it does get tedious with the long shots of the Enterprise traveling through V’Ger, I like the subtle message it’s sending about how humanity is in way over its head on this adventure through the unknown. I like how 2001 portrays its ships in a realistic manner. Docking bays are small and cramped, and all the parts of the ship look like they’re optimized to function using the least amount of space and materials. The Enterprise docking bay, on the other hand, is expansive, and it doesn’t look like it’s well-equipped for a hull rupture or other potential problems. Music plays a huge part in Star Trek: TMP and 2001. 2001’s soundtrack is made entirely of classical music while Star Trek: TMP’s score sounds like it was heavily influenced by classical music, especially Ilia’s Theme. 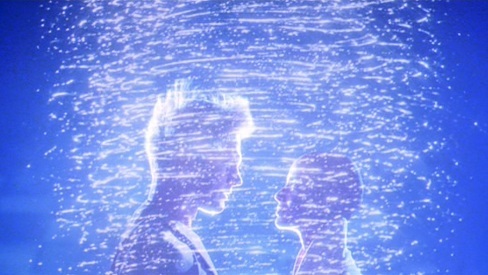 When Kirk and Scotty first approach the Enterprise, the music swells and conveys all the emotions going through Kirk’s mind. It has a lot of nostalgia in it, as well as a yearning for new adventure. The music that plays while the Enterprise is traveling through V’Ger is surprisingly low-key. It’s almost like the music is trying to avoid distracting us from what’s happening onscreen. But since nothing particularly interesting is happening in the film, it would have been nice to at least have some epic music to listen to. It’s impossible not to think of 2001 when you listen to Thus Spake Zarathustra or On the Beautiful Blue Danube. Thus Spake Zarathustra implies how something small and insignificant can bring about something great as its quiet notes move precipitously higher before exploding into loud, booming high notes. It’s appropriate that this short tune comes at the beginning and end of the film because the movie shows that from humble beginnings man has the ability to become godlike. The Blue Danube captures the majesty of space travel pretty well, though I don’t think it’s as perfect a fit as others think. To be honest, I much prefer how it was used in Heaven’s Gate over 2001. Heaven’s Gate‘s opening scene captures the fun and, dare I say, whimsical features of the music in a fantastic way as the characters dance faster and faster in a circle. A ship orbiting the earth and docking just doesn’t quite gel with the musical cues. Willard Decker and David Bowman have a lot in common. Both of them trained for years to get to where they are. They sacrificed time with family and many other things to prepare for taking command of a starship. For Decker, it was to be the Enterprise, and for Bowman, it was to be the Discovery. Both of them did get to be in command for a while. Decker was in charge of the Enterprise during its complete refit, and Bowman was responsible for getting the Discovery to Jupiter. However, before the Enterprise could even leave dry dock, Decker is replaced by Admiral James T. Kirk and reduced in rank from Captain to Commander. Bowman was going to be relieved of command when he awakened the hibernating crew members and they announced their new orders. However, that never happened, for reasons we’ll talk about shortly. In both of these cases, the Commander was not informed by his superiors that the entire focus of his mission was about to change. They both respond with solid professionalism, though. Decker slips into the role of Second in Command quite well, offering helpful advice and never complaining. Bowman, upon learning the true nature of his mission to Jupiter, still fulfills his duty and gets the ship safely to its destination. The crew doesn’t know what to expect from the journey ahead of them, and some of them have conflicting objectives. The Enterprise crew believes they’re on a mission to save humanity from a strange new threat. At the same time, Spock is on a journey of self-discovery, and he is using the Enterprise to get closer to V’Ger and satisfy his curiosity. Bowman and his Second in Command Frank Poole are completely in the dark about the true nature of Discovery’s voyage to Jupiter. At the last minute before they left on their multi-month journey, HAL-9000, the computer aboard the Discovery, was programmed to complete the journey at all costs, but not inform Bowman or Poole about the Monolith that awaits them in orbit around Jupiter. The fact that one character is keeping secrets from the crew creates a lot of tension and drama. This is probably the most interesting part of both films. Spock’s journey from a logical, distrusting character to one with a healthy respect for human emotions is intriguing. HAL’s nervous breakdown and malicious behavior are by far the most riveting parts of 2001. It might seem like a small detail, but it’s interesting that a character in each film winds up drifting through space. In order to learn more about V’Ger, Spock steals a spacesuit and goes outside the Enterprise. Unfortunately, his contact with V’Ger knocks him unconscious, and he hurtles back toward the Enterprise. Luckily, Kirk catches him and brings him aboard safely. 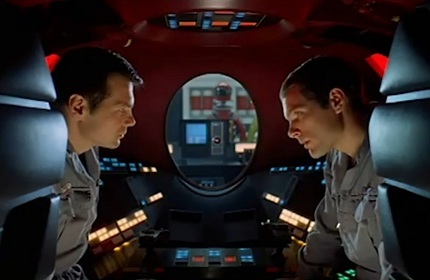 In 2001, Poole is trying to replace an essential unit of Discovery’s satellite when suddenly HAL takes control of his space pod and uses its manipulator arm to cut his oxygen supply. Poole presumably dies and then floats off into space. Bowman chases after him, but he’s unable to bring him back into the ship because HAL refuses to open the pod bay door. The reason I include this isn’t just that two characters go spinning out of control in a similar fashion. This actually marks a significant turning point in both films. Spock’s experience starts to open his eyes to what V’Ger truly is. It’s searching for meaning to its existence, but it can’t comprehend such a simple thing as human friendship. V’Ger thinks its creator will be able to explain its purpose, but it doesn’t know who or what created it. All it knows is that it came from earth. In contrast, HAL’s sudden transformation into a homicidal maniac forces Bowman to show the machine what it means to be human by taking matters into his own hands. He does something HAL never would have predicted because it’s totally illogical: blowing himself into the void of space without a helmet in order to get to the airlock. Man, that’s an awesome scene! The stakes suddenly rise to a fever pitch when V’Ger threatens to wipe out all life on the earth, and HAL kills everyone aboard Discovery except Bowman. When Bowman is stranded by HAL outside the ship, he tries to reason with the supercomputer. However, HAL won’t have any of that, and he abruptly ends the conversation by saying, “Dave, this conversation can serve no purpose anymore. Goodbye.” Ouch. In order to lure humans into its clutches, a supercomputer damages its own hardware in both films. V’Ger has no choice but to give in to Kirk’s demands to reveal itself to him. 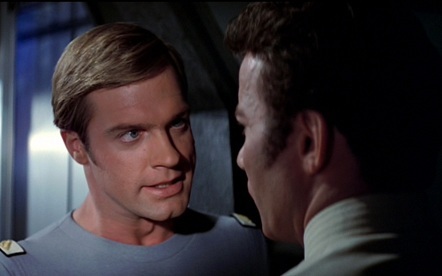 Kirk learns that V’Ger is actually the Voyager 6 probe, which has become a giant, self-aware computer containing all the knowledge in the universe. When he tries to use an old NASA code to get Voyager 6 to transmit its data as it was originally programmed to do, V’Ger destroys its own circuitry. It wants to bring the creator in direct contact with itself so it can become one with him. This is analogous to two scenes in 2001. HAL becomes nervous that Discovery’s mission will not be fulfilled as planned and he’s also worried that Bowman and Poole could disconnect him. So he pretends that the satellite, which they use to communicate with earth, is on the verge of failure when it is clearly not. He’s actually luring Bowman and Poole outside of the ship so he can get rid of them. After thwarting HAL’s plans and getting back inside the ship, Bowman makes good on his promise to disconnect HAL. There is an intriguing alien being whose identity is never explored in either film, but its presence can be felt throughout the story. In Star Trek: TMP, Kirk and his team learn that a planet full of machines (the Borg?) built V’Ger’s huge cloud-like structure so it could fulfill its mission to accumulate all knowledge in the universe. However, we never find out anything about that planet or the aliens who made all of this possible. I think it would have been interesting if they turned out to be Kryptonians. 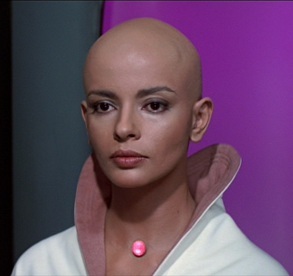 Hey, they invented Brainiac, and his whole goal in life sounds a lot like V’Ger’s. It could happen. 2001 hints that an unknown intelligence left the Monoliths on earth, buried on the moon, and in orbit around Jupiter in order to reward humans’ progress as they venture forth into space. The book does a better job of laying all of this out, but the movie could still be interpreted that way. The aliens’ nature and origin are never revealed in the film. Is earth the only world they’ve visited, or just one of many? Did they create life in the first place and help it develop the same way they did? Who created them? Do they look like humans? Based solely on the film, we don’t have the faintest clue about the answer to any of these questions. The ending of both films is vague and noncommittal. Basically, a human joins with a machine/Monolith to become a new lifeform, but there’s no indication of what that new lifeform is or what its purpose may be. Commander Decker somehow joins with Ilia/V’Ger, and they disappear in a brilliant flash of light to go explore other dimensions, or something like that. Spock notes, “We witnessed a birth; possibly a next step in our evolution.” That seems less like a step and more like a giant leap into some completely new species. Commander Bowman finally reaches the Monolith in orbit around Jupiter, and he leaves Discovery to investigate. The movie gets extremely ambiguous at this point. If I understand it correctly, Bowman flies into the Monolith and, after a long series of special effects, arrives in a white room representing his life as a human. He quickly progresses to extreme old age whereupon he enters the Monolith once more to become reborn as a space baby. It’s weird to see such a mystical ending to a film that was trying to ground itself in reality. The ending appears to be religious in nature: we witness a character’s resurrection into a heavenly being. At least they didn’t go off the deep end and search for God at the center of the galaxy, like in Star Trek V: The Final Frontier. Star Trek’s catchphrase is “To boldly go where no man has gone before,” and 2001’s tagline is “The ultimate trip.” A casual observer might think they have a lot in common because they’re both about fantastic journeys. Star Trek probably seemed like a natural precursor/follow-up to 2001. It’s an attempt to show humans realistically traveling through space in the distant future. The problem is that that’s where the similarities end. Star Trek is all about its characters and how they react to complicated situations. It’s not about the hardware. Spaceships and gadgets allow them to explore strange new worlds, but they rarely take center stage. 2001, while presenting a few interesting ideas, mainly focuses on the possibilities of technology. We don’t really see the progression of man’s ability to reason, but we do see that his ability to create things has increased. Think about it. Each time a human (or something like a human) approaches a Monolith, he does so by timidly reaching his hand out to touch it. Why does he feel a need to touch it like a simple animal each time? Maybe he could bring a device to analyze it or try to communicate with it. It would be nice to see them do something different each time. Star Trek: TMP is a slow and lethargic film for many people because Star Trek doesn’t fit with 2001. We’re so invested in the characters that seeing them have so little to say or do feels like a waste of their talent. 2001’s characters never become particularly interesting. They’re just along for the ride. All in all, I don’t dislike either of these films, but I do think they’re over-praised for the wrong reasons. I’ll revisit this topic when I point out some surprising similarities between 2010: The Year We Make Contact and a certain Star Trek sequel. This entry was posted in Movie Matchups and tagged 2001 a space odyssey, alien, classical music, dave bowman, drama, enterprise, evolution, film score, films, fun, funny, hal 9000, heavens gate, humor, james t kirk, jerry goldsmith, jupiter, klingon, krypton, leaders, monolith, movie review, movies, music, NASA, religion, science, science fiction, soundtrack, space, space exploration, spock, stanley kubrick, star trek, superman, TV shows, voyager, youtube. Bookmark the permalink. Good match up. Star Trek is the conventional of sci-fi compared to Kubrick’s way out there Arthur C Clarke look at it. Reading through your similarities list though, it struck me that you could apply this list to many other sci-fi flix. Alien jumps out. But it’s also a pretty good structural run-down of quite a few others too where the real issue is control vs chaos/ knowledge vs ignorance and everything else is just set dressing. Totally loving the puns. Makes me feel SO much better. Going to post my 2001 back on my blog now – you might like it. Will reblog this post to go with it! Thank you very much for your kind comment. I hadn’t really thought about how the similarities I mentioned between 2001 and Star Trek: TMP could relate to Alien or other science fiction films, but I can see what you mean. Pues una verdadera copia de 2001 odisea del espacio es sin duda alguna la del Secreto del abismo The Abyss, protagonizada por Ed Harris, lo diferente fue que era el fondo del mar, pero el viage en la capsula fue exactamente igual hasta su contacto con los alienigenas. Se puede decir que 2001 Odisea del espacio es y sera un parteaguas en los que a paliculas de ficcion y no ha sido nuevo que una pelicula inspire a otra en su contenido. Very true. 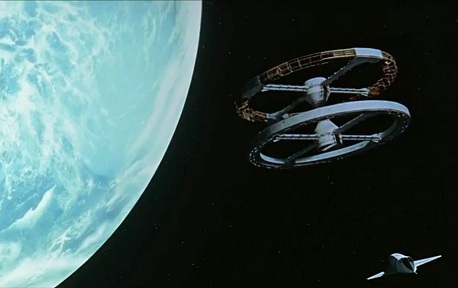 The Abyss is a wonderful movie and it does have some interesting parallels to 2001: A Space Odyssey. But I think the overall tone and message of The Abyss differ significantly from 2001. The Abyss is an action movie with an intelligent idea at its core. 2001 is definitely not an action movie, and it seems more interested in bringing up questions and being vague about the details of what’s going on than in offering answers to big questions. Muchas gracias por tus palabras interesantes. Ten un buen dia. V’ger and his creators are thousands years more advanced than the Borg. The movie shows this fact clearly.